I like to sauce this dish to taste. I’ve had some experience with these ingredients though, so if you are uncertain what proportions to use, use less of what you would think for soy sauce to be safe. 10 minutes into the dish you can taste an onion and see what it needs. Sweeter? sugar and mirin, or one or the other. Not Savory enough? more dashi and soy sauce or one or the other. You get the idea. With a little oil (and no salt) cook the onion and garlic on low until it begins to soften and become translucent (10 minutes or so). 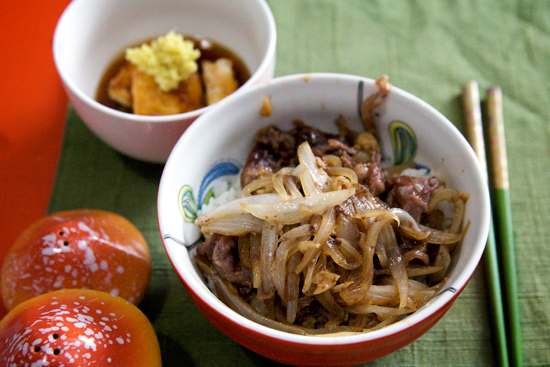 Lay the meat on top of the onions along with the sake. Add soy sauce, mirin and sprinkled sugar. After a few minutes, add 1 cup of dashi stock. You can let this simmer, or serve once the meat is cooked through. I personally like to let it cook for 10-20 minutes. This is also good with a raw egg on top after the dashi stage. Serve over rice. I prefer this dish with firm tofu, although many people swear by silken. Try them both. Press your tofu block between many sheets of paper towel and something heavy (books are good) for 30 minutes. 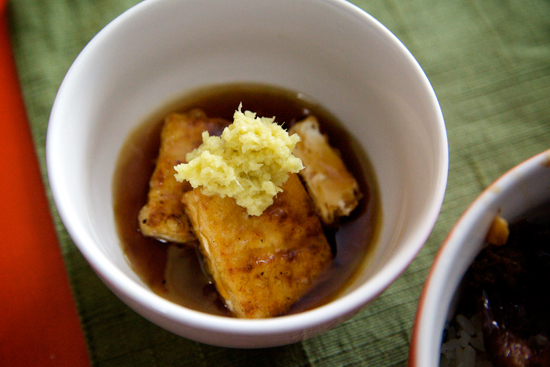 While you wait for the tofu to dry, prepare a sauce of dashi stock, a little soy and a little mirin. You can use a soup base as well. Thicken the broth with corn or potato starch and keep warm on low. To top the tofu, grate a large portion of ginger. Slice into fat rectangles. Heat cooking oil to frying temperatures. Right before placing the tofu in the oil, coat liberally with potato or corn starch. Fry on both sides until golden brown and delicious. You want to serve this dish immediately, if you let it sit for too long the tofu will lose its crispy texture. I LOVE Agedashi Tofu but have never made it at home. Thanks! Love the pics and the food. Can’t go wrong with Japanese, as the saying might go. Looks good! Gyudon is nice and easy to make and always turns out great.